The PSAT/NMSQT is given in mid-October. It is taken in your home school and most schools give it during the school day (Wednesday). Some schools will give it on a Saturday. While some freshman and sophomores will sit for the PSAT as practice, juniors are sitting for their “official” PSAT/NMSQT score. There is an additional practice PSAT for sophomores called the PSAT 10, which is given in February. Also, the PSAT 8/9 is offered for 8th and 9th graders, which is a little shorter and a little easier and should be avoided at all costs. Your PSAT results are not submitted on your college application and you do not have to take it. However, if you achieve Commended Scholar (approx. top 5% nationally) or National Merit Semi-Finalist (approx. top 0.5% in your state), it is a notch on your college application resume and could qualify you for a number of scholarships. It is also helpful in determining whether you should be focusing on the SAT or ACT. The PSAT is scored on the same rubric, but a slightly different scale, as the real SAT. 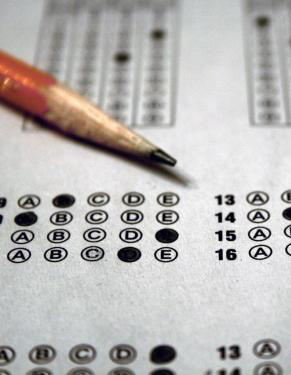 While the new SAT is scored on a scale of 400–1600, the PSAT is scored on a scale of 320–1520. The raw scores from the Reading and Writing sections are combined to get a scaled Reading/Writing score ranging from 160 to 760. The raw scores from the no calculator and calculator Math sections are combined to get a scaled Math score ranging from 160 to 760. There is no penalty for wrong answers. To calculate your NMSQT (National Merit) score, divide your Reading/Writing score by 5, divide your Math score by 10, and add them together. In other words, take away the zeros (i.e. 710 becomes 71) and double-count the Reading/Writing score. The test contains four sections: Reading; Writing; Math with no calculator; Math with calculator. · Reading: 47 questions in 60 minutes. There are five passages total from the categories of science, literature, history/social studies, and social science. While the revised PSAT no longer contains obscure vocabulary, it now tests second and third definitions of more common words with multiple meanings in context. The readings also feature charts and graphs. · Writing: 44 questions in 35 minutes. There are four passages with 11 questions each. There will be one passage each from the categories of careers, history/social science, humanities and science. The questions address issues of writing style, grammar usage and mechanics. The writing passages will also feature charts and graphs. · Math (No Calc): 17 questions in 25 minutes. This section requires basic algebraic skills normally handled by calculators. In addition, this section places a high emphasis on word problems, real world applications, functions, statistics/data analysis, systems of equations, rate, sequences, and trigonometry. While some 2-D and 3-D geometric formulas are provided at the beginning of the section, knowledge of additional formulas is required. · Math (with Calc): 31 questions in 45 minutes. This section requires functional knowledge of a graphing calculator. In addition, this section places a high emphasis on three areas: linear equations; complex equations or functions; and ratios, percentages and proportional reasoning. While some 2-D and 3-D geometric formulas are provided at the beginning of the section, knowledge of additional formulas is required. Should you prepare for it? The answer is maybe. For most students, it is just a little early practice and exposure to the test format and not worth starting the prep process too early. However, if you did very well on your sophomore PSAT and think you may qualify for National Merit, it should be considered as part of an early testing schedule. You can prepare for the October PSAT and then piggyback that prep onto a November or December SAT test date. If you have additional questions or would like to schedule a consultation, please call Prep U Chief Tutoring Officer David Storper at 202-255-0133 or e-mail prepututor@gmail.com.